The design of a city church may require deliberation and architectural plans, but once built these churches become ad-hoc museums. The statues and objects and other sacred ornamentations are accumulated across decades and generations. Few United States cities have the number of Roman Catholic churches that boast such fascinating treasure troves as the charming old places of worship that call Jersey City home. Most of the time, people just come into pray or attend mass, but taking the time to appreciate the diversity and uniqueness of each object can be surprisingly rewarding. Often there’s a tag near the statue or object signify who bequeathed the object to the church. Each one has a story and most of those stories have been lost, which is probably as it should be because the point of this object is not to memorialize a heartfelt tale of how an individual’s life resulted in funding a permanent symbol of faith. The purpose of the object is for others to conceptualize a shared belief. 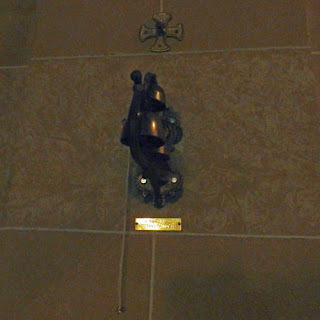 Saw these Sanctus bells at Saint Mary’s church on second street. 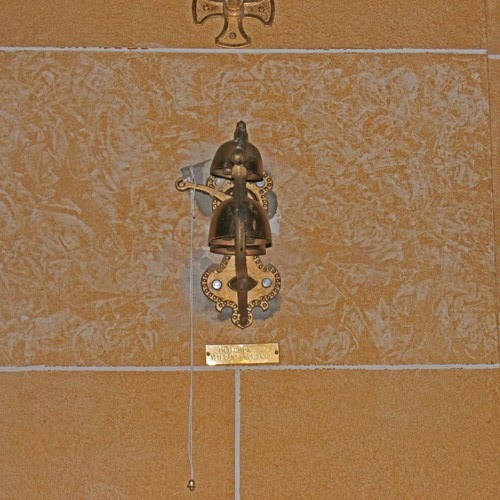 The bells are rarely if ever used anymore, they were probably originally intended to signal the start of a mass. They are in the front of the church, at the entrance, and where the priests and altar servers congregate before processing up the aisle to the altar and begin mass. 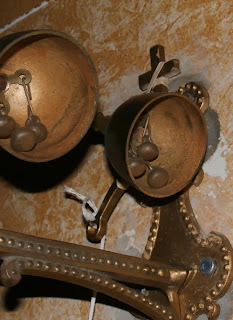 The main purpose of these bells is that before processing to the altar they are rung to signal the congregation to stand. You hear these chimes and you get on your feet and start singing the designated hymn. 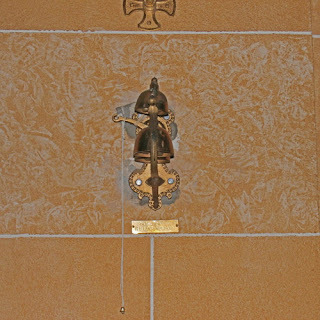 The bells are a trio – symbolizing The Trinity – they are not fancy, no delicate and complicated filigrees ardor the chimes. They are simple, functional – here to get the job done, a simple apparatus so believers can get on with the business of worship. But look at the tiny plaque. In Memory of World War II Veterans. Suddenly, another back story is layered into the city church context. I know nothing of the history of these Sanctus bells – I’m actually only surmising their knells signaled the start of a mass, they may have had additional uses. But I wonder how they came to be here. When Jersey City soldiers returned home from the European and Pacific theaters, most were in their early 20s, the benefits of the GI Bill were not yet in effect, starting careers, raising families, those were all in the future. Time needed to pass before veteran groups had formed and pools of funding could be created to be able to give Saint Mary’s church (which also had grammar and high schools, now long closed). Then somebody had to see the need for bells, and set up a project to get those bells. By the late 1950s, World War II veterans had become the dominating social force forming our nation’s society. They were the ones getting things done. These bells, they are not even used anymore, that particular knell is no longer a common custom of ritual. 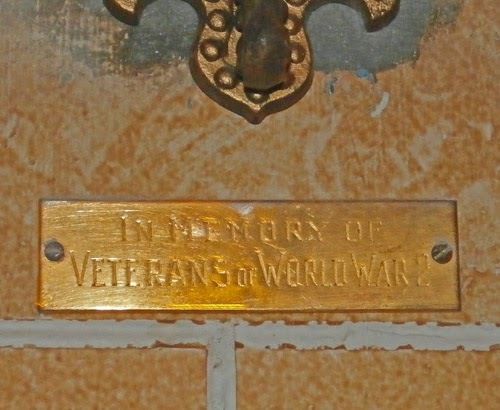 The bells may rarely ring, but they still provide a quiet remembrance of some soldiers who knowing they were blessed with returning home alive, decided to acknowledge their presence and express their thanks in their church. The day has come when those soldiers are gone but these bells now last forever.